More than a year ago, Marine Corps Times broke news that the Corps was considering overhauling its swim qualification program, taking aim at a surprisingly large number of Marines who met only the minimum standard for combat water survival. Now, the Corps has rolled out those new standards, dramatically altering the way the program is structured. It goes straight to the heart of being a Marine, a “green, amphibious monster who arose from the sea,” as the saying goes. They differ significantly from what was proposed more than a year ago and previously outlined in our pages. 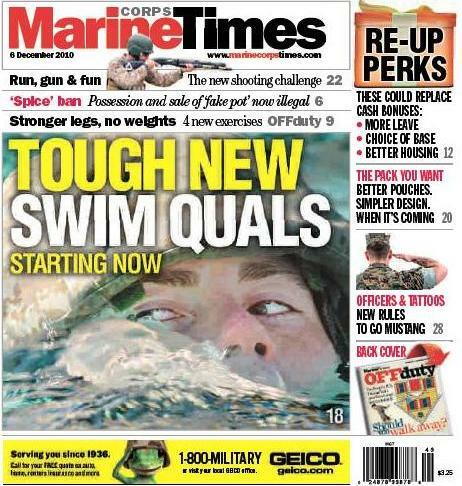 Marine Corps Times outlines the new rules for swim quals in our cover story this week, explaining the ins and outs after sitting down at Marine Corps Base Quantico, Va., last week with one of the officers overseeing the program. To check it out, pick it up on newsstands or subscribe here.